The Calamity Chronicle: We Bring Everyone Home...Period. Ridiculous, isn’t it? We all know that if the President of the United States said something like this, the media would go bananas. The reason this scenario sounds ridiculous is because it is exactly ridiculous. But, all of a sudden, there are pundits and armchair politicians, media outlets, and the typical peanut gallery of radical conservatives who believe this is what the President should have said. The very people who claim to have supported this soldier and prayed for his safety and return, despite the circumstances of how he was captured, have now decided he was not worth it. They’ve deleted their supportive tweets. They are denying support that they once freely gave on the record, on camera. This is a new level of low for the political right, who have always prided themselves on being supportive of our military and not leaving any of our soldiers behind. They do not seem to think that this soldier was worth the negotiating of five members of the Taliban who have been imprisoned in Guantanamo Bay for more than a decade. According to the voices on the right, these prisoners were more valuable sitting in a prison than an American soldier, suffering at the hands of the Taliban. They argue that the soldier wandered off base, deliberately deserting his post, and that’s why they can’t justify a prisoner exchange. Why should we break our necks to get to a guy who carelessly wandered off and was captured? An American soldiers life and value are suddenly conditional. We don’t know the whole story about what led to his capture or why he wandered off base, but according to the right, we shouldn’t even care to find out. We should have left him for our enemies to devour. 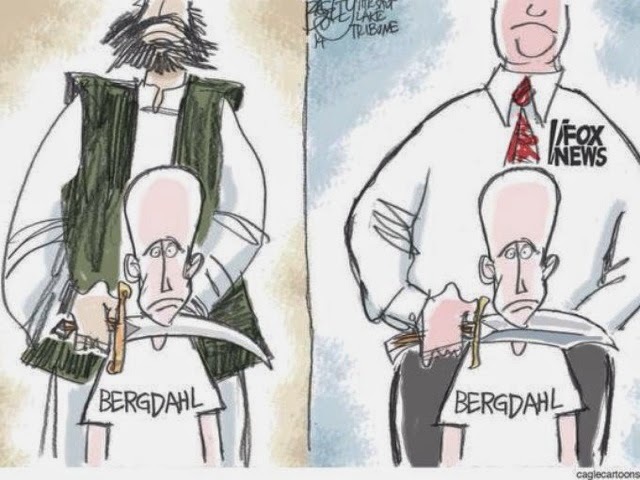 Instead of at least getting him back here and conducting a proper military investigation, apparently we would rather let the Taliban serve up their version of military justice. And we are so short sighted that we don’t realize that doing nothing hurts us more in the long run. So, this is how we treat our soldiers and POW’s now? We leave American soldiers to die if we think there was something “off” about the circumstances surrounding their capture? They also argue that these 5 Taliban prisoners released from Guantanamo are supremely dangerous and criticize the President for releasing them “back to the battlefield.” But I think that’s seriously misguided thinking, on a couple of levels. First, these guys have been out of the fight for over 10 years. Let’s face it, war is different now than it was 10 years ago. Plus, if they were so dangerous, how is it that we managed to catch them? We have this problem where we make these guys out to be a terrorist version of Jack Bauer or some group of X-Men, and it’s just not true. In fact, thinking that these guys are supremely dangerous is kind of giving them exactly what they want…our fear of them is exactly the kind of terror they hope to inflict upon us. So, let’s not give them that perceptual victory, ok? I’m having a hard time fathoming that the political right believes that we should usher in a new era of conditional military procedure, where we don’t always bring all of our people back home, which is why I don’t buy it as a valid response for the right. There’s something more at work here…and I think it has to do with the party affiliation of the man who sits in the Oval Office, and the fact that there are elections coming in November. If you’re still operating with the hope that Congress will get something done, you’re living in a different dimension. These people have no concern whatsoever about governing or doing what you or I trusted them to do. They have no regard for lives being affected by their inaction in the here and now. They don’t do their job because they are consumed with keeping their job. And shame on us for letting them. Shame on us for allowing them to imply that we should let a soldier remain a captive and die because he deserved it for walking off of his base. Shame on us for letting them decide that is how military justice should be served. Shame on us for letting them forget about Iran-Contra, or about all of the Gitmo detainees released under President Bush. Shame on us for allowing Gitmo to still stand. The two sides we are seeing in this situation with the soldier have nothing to do with what we see at the surface. It’s all about providing that sound clip, that video clip to be used in the million dollar ad buys we will be suffering through all summer and fall until November. It’s all about face time on the Sunday shows and promoting another book or some other product. And if you’re buying what they’re selling on Fox News or Glenn Beck or Alex Jones, then you’re a sucker. You can’t be the party of family, pro-life values, driving around with a yellow ribbon on your vehicle that says “Support Our Troops” and decide that an American military family doesn’t deserve to have their son come back home alive, and at least be able to give us all some answers for why he wandered off of that base. Keep an eye on the politicians who will continue to argue that we shouldn’t have brought Bowe Bergdahl home…and watch how they will have to defend their talking points as they campaign over these next several months. Then, you will see the true motivations of these folks. We don’t leave anyone behind, period. And if you think we should or that there are caveats to that mantra, then I hope you never have to face a family who had their loved ones returned home in a flag-draped coffin, or speak with a soldier who has returned home maimed emotionally and physically. Because if you could stand there and argue that we don’t bring everyone home or that there are conditions in which it is ok to let a soldier die, then I would argue that you have lost your soul.